These are genuine Ford Motorcraft Fuel Injectors from Ford. Injectors will be shipped FedEx 2nd Day Air for FREE! 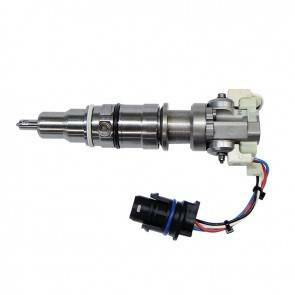 The Internal components of the Power Stroke Diesel fuel injectors are precisely engineered to the extreme tolerances that are so critical in the 6.0L Injector Assembly. Motorcraft Replaces the Entire Coil Assembly for each injector to prevent wire fatigue and poor cold-start conditions. Then, high pressure sealing surfaces inside the cylinder head assembly are refinished to original specifications (less than 2 microns of flatness). The precision flatness of these surfaces is critical to high pressure (20,000-plus psi), injection systems and assures long engine life, good mileage and performance. All Injectors have New Plungers installed in the intensifier bodies with precision-match honed to operate flawlessly at extreme pressures and temperatures with 100% durability and reliability. Nozzle Assemblies are Inspected, then chemically treated and micro brushed to remove carbon and fuel residue. Each nozzle is then tested to ensure proper performance and emissions levels – the results: you needn't worry about high carbon buildup, nozzle coking, poor performance or emissions issues. Motorcraft offers New Rod Assemblies, new M4 screws and cone nuts, 100 percent flow-tested nozzles and nitrogen leak tested injector assemblies. If you select "Will send core in later. ", you need to send the your injector core if you wish to receive a refund for the core amount. Core must be returned within 60 days of product delivery. After 60 days there will be a late fee of 10% per month deducted from the core value. Core will need to be sent to KT Performance with a copy of your order confirmation or invoice in the box. Cores that are rusted or coked will not be accepted (Coked cores are the result of running vegetable/waste oil.). *Labor may have a limit. See your seller for a copy of the limited warranty. Do-it-yourself customers are not eligible for labor reimbursement. Cores must be returned to KT Performance within 60 days of product delivery. After 60 days there will be a late fee of 10% per month deducted from the core value. Mechanic that installed seemed to like them. been in for a week now and haven't had any issues yet. Truck running good now.